It may just be me but I have never been hugely fond of front derailleur’s, yes I like that they make it easier for me to pedal, but they can be a huge pain in the… well, you know. Often, they are finicky and downright argumentative, resisting adjustments with a stubborn resolve not often witnessed elsewhere. 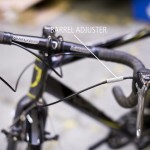 Most of the time (9 out of 10) a quick adjustment to cable tension will coax these little guys into submission and make sure that your bike is shifting with smooth precision. However, if you start attacking your derailleur with screwdrivers and allen keys, and no knowledge of their function, trying to force it into submission then you may well end up over your head, angry and ready to throw your bicycle off a bridge. If you get to this point, put the screwdriver down, take a deep breath and walk away. When you are ready to look at your bike again swallow your pride and take it to a shop to have someone well versed in the art of wooing derailleur’s help you get back on its good side – there is no shame in doing this, not everyone understands the temperamental nature of front derailleur’s. Don’t waste your time, ask the hard question: is your derailleur bent? First thing is first, check to see if your derailleur is obviously bent or damaged; if the answer is yes, then take your bike to your local shop and let a mechanic help you sort it out. I’m sure it happened while you were just riding along (JRA), but don’t tell anyone at the shop that it wasn’t your fault, it grates the nerves of shop staff like you wouldn’t believe. Because there is always a reason your derailleur was bent: there is no such thing as the immaculate bending of a derailleur. Most of the time your front derailleur will be set up properly at the shop you bought it from and the only thing you will have to worry about is cable stretch. Just like a guitar string bicycle cables are wound and during the first few hours of use will stretch making your shifting go a little wonky. For your front derailleur wonky could mean that your derailleur starts rubbing on your chain or maybe your chain will be more resistant to the coaxing of your front derailleur as it guides your chain into larger rings. 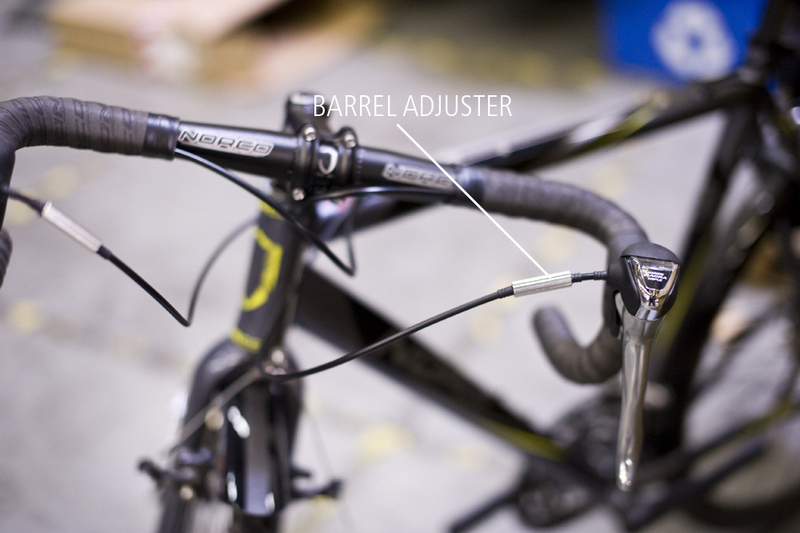 This little quibble with your front derailleur is easy to remedy because the people that made your bicycle also included a tool free adjustment in the form of a barrel adjuster (images below) to fix problems that arise from cable stretch. 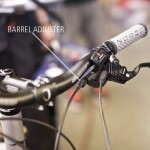 There are three places where you might find this simple adjustment: on the shifter itself, on the cable casing or on the cable guide on your downtube. If your derailleur is slow to move up into a bigger ring then turn the barrel adjuster counter-clockwise in small increments until it feels just right. If you go too far then practice the opposite, turn the barrel adjuster clockwise until your shifting feels good.. 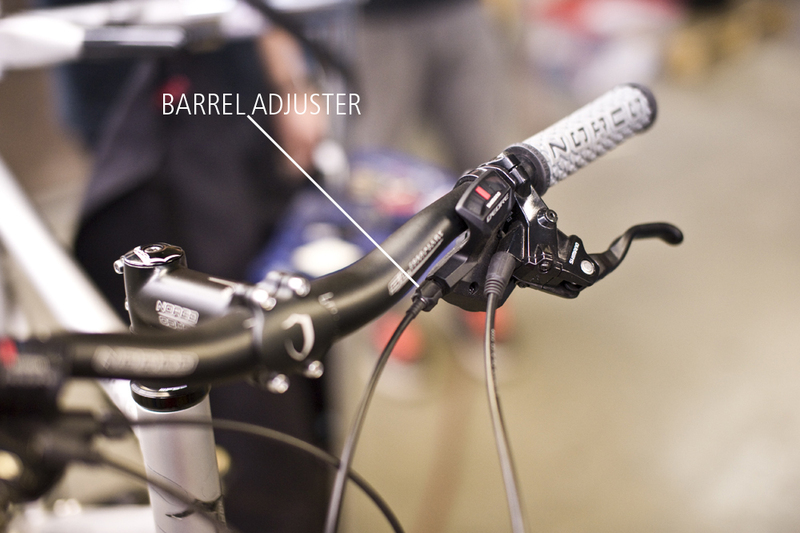 If the front derailleur has too much slack and you are maxing out the barrel adjuster adjustment, you can take up excess cable slack by adjusting the cable tension at the cable clamp of the derailleur. With a hand and often dandy 5mm allen key in hand you can get things dialed. 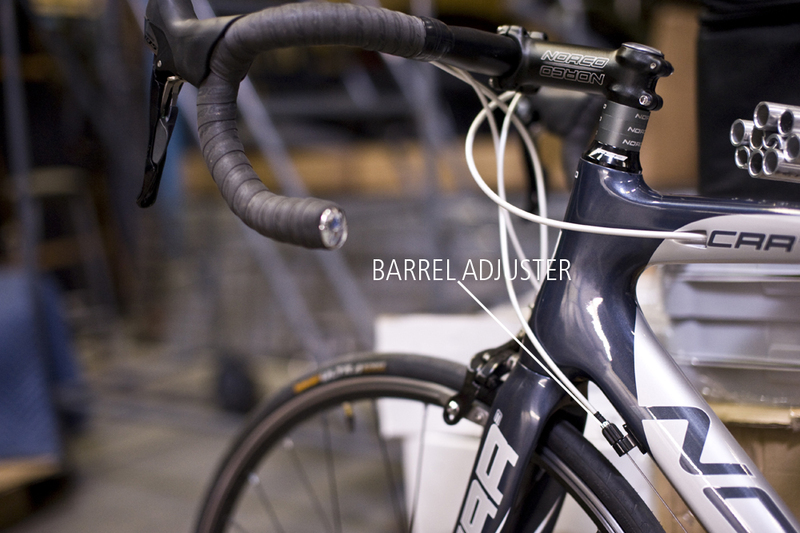 Make sure to wind in you barrel adjuster ¾ of the way so that you have some leeway for micro adjustments after you have adjusted the cable slack at the clamp level. Know your limit(s): adjust within it. Your Front derailleur is been adorned with two limit screw marked L (Low) and H (High) these two little screws control how far your chain can travel to either limit of your derailleur. The “High” controls the big ring: if it is too open then the chain will move past the big ring and fall off, wrapping itself like a snake around your pedal and crank arm – embarrassing. The “Low” controls the littlest ring and just like the Littlest Hobo if you leave it too open when you go to shift down it will run off the ring towards the frame sometimes getting stuck between the crank and the bicycle frame, which isn’t cool like the Littlest Hobo. Bad simile’s aside if the cable tension is good and the chain leaps off of the big ring with vigor then you need to close the high limit screw. With a small Philips head screwdriver turn the limit screw clockwise a little bit at a time and then double check to make sure your chain is now in check. If the chain won’t make the jump to a larger ring with enthusiasm then you will need to open the limit by turning the limit screw counterclockwise until the derailleur coaxes the chain onto the correct ring. Double check your work and now revel in your mechanical excellence – job well done. For the little ring the adjustments are the opposite. 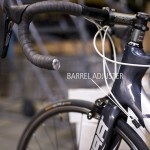 If cable tension is set up correctly but your chain won’t go down into the little ring, you can open the low limit by turning the low limit screw counterclockwise. If the chain is going too far, close the limit by turning the screw clockwise until it is just right. Again take time to revel on the marvelous adjustment you have just made. Well, that is the simple explanation on front derailleur adjustment. I have by no means covered everything that can go wrong nor the absolute all in the tricks and tips of keeping it running smooth. If you have any question or would like more information leave a comment and I will do my best to help you out. That goes for any bicycle maintenance questions. Throw them our way and we’ll try and help you get them dialed. There are many variables and more way to solve problems with this delightfully frustrating piece of equipment but I would have to write a small novel to get through them all. Suffice to say, if at any point you feel like you are sinking the derailleur adjustment boat and find yourself considering throwing your bike out a window in frustration, cut your losses, swallow your pride and go and see your local shop, they can help you out of the muck. But if you have the patience, check out the derailleur guides below, take your time and you will be rewarded with awesome shifting, hopefully. Now go and ride.